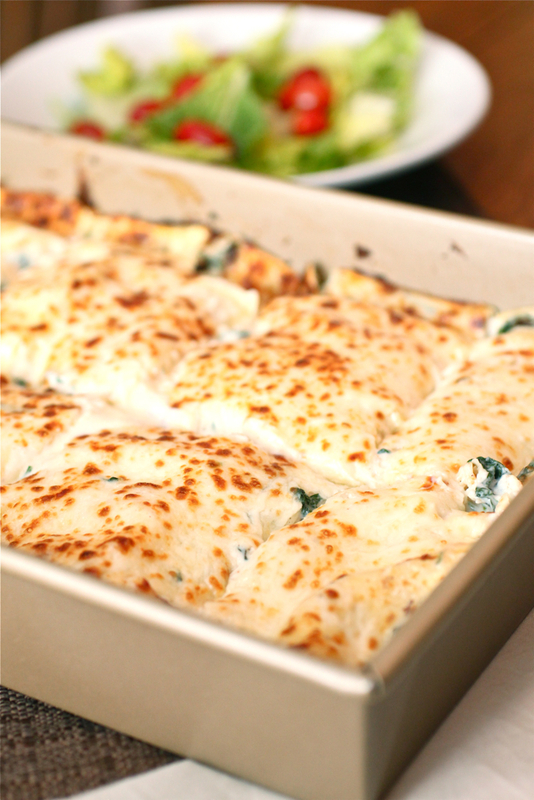 You’ll never eat a more phenomenal and comforting spinach lasagna than this one! Easy to make with no-boil noodles and the cheesiest of sauces! There’s something intrinsic about lasagna that makes it such a wonderful fall and winter meal. It’s more than likely that oodles of cheesiness has something to do with how a great lasagna can warm the soul on chilly nights, very much like how soup has the same effect, but I think that the right recipe can do so much more. The right recipe creates memories. It evokes memories of crowded Sunday dinners at the grandparents’ house. Of a warm and hearty meal after a day of sledding or ice skating. Of a full buffet table at a christening or anniversary party. This spinach lasagna is that type of recipe. Made with a super easy homemade creamy béchamel (milk) sauce, three types of cheese, fresh spinach, and no-boil noodles that you’ll soften with hot water before using, this lasagna is a BIG hit around here. It’s a fun recipe to make with a helper since there are a few steps, but the effort is TOTALLY the end result. 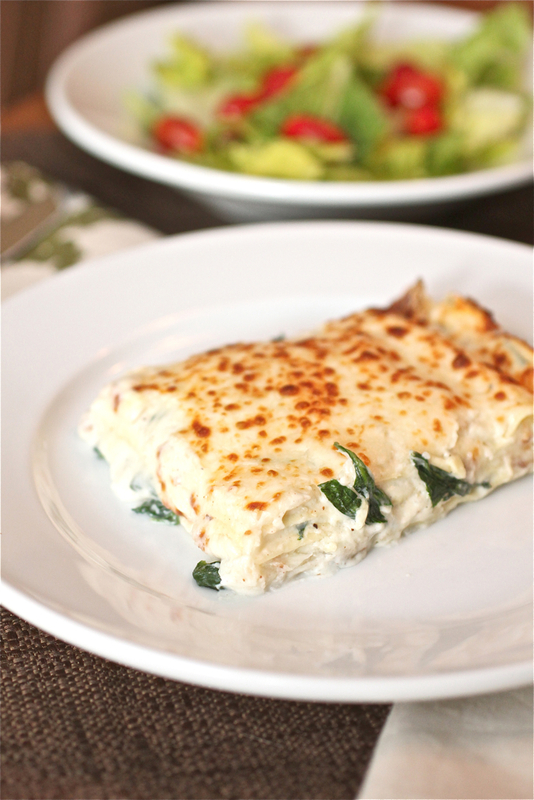 This is pretty much the best spinach lasagna I’ve ever eaten! Layer after layer goes in the baking dish and after 20 minutes of baking and a few minutes under the broiler to brown-up the cheesy top layer, you’ve got truly the best spinach lasagna ever. Seriously. The BEST. EVER. We’ve made this recipe more times than we can count and we always get the same reaction from whomever we serve it to: MORE PLEASE! This is definitely a recipe we keep in our book of favorites and don’t hesitate to serve time and time again. To prepare the spinach: Fill large bowl with ice water. Bring 4 quarts water to boil in large Dutch oven or stockpot over high heat; add salt and spinach, stirring until spinach is just wilted, about 5 seconds. Using skimmer or fine-mesh strainer, transfer spinach to ice water and let stand until completely cool, about 1 minute, then drain spinach and transfer to clean kitchen towel. Wrap towel tightly around spinach to form ball and wring until dry. Chop spinach medium and set aside. To make the béchamel: Melt 5 tbsp butter until foaming in medium saucepan over medium heat; add shallots and garlic and cook, stirring frequently, until translucent, about 4 minutes. Add flour and cook, stirring constantly, for about 1 ½ minutes. Do not brown. Gradually whisk in milk. Bring mixture to boil over medium-high heat, whisk in bay leaves, nutmeg, salt, and pepper. Reduce heat to low and simmer 10 minutes, whisking occasionally. Whisk in Parmesan and discard bay leaves. Transfer sauce to bowl, press plastic wrap directly against hot surface, and set aside. To prepare the cheeses and pasta: Blend cottage cheese, egg, and salt in food processor or blender until very smooth, about 30 seconds. Transfer to bowl and set aside. Adjust oven rack to middle position and heat oven to 425° F. Place noodles in 13×9-inch broiler-safe baking dish and cover with hot tap water; let soak 5 minutes, agitating noodles occasionally to prevent sticking. Remove noodles from water and place in single layer on kitchen towel. Wipe baking dish dry and grease with remaining 1 tbsp butter. To assemble: Spread 1/2 cup of the sauce over the bottom of the baking dish and lay 3 of the noodles lengthwise on top of the sauce. Mix the spinach into the remaining sauce until it is evenly distributed. Spread 1 cup of the spinach mixture evenly over the noodles, sprinkle all of the Parmesan cheese evenly over the mixture, and top with 3 more noodles. Spread 1 cup of the spinach mixture evenly over the noodles, sprinkle 1 cup of the fontina cheese evenly over the mixture, and top with 3 more noodles. Spread 1 cup of the spinach mixture evenly over the noodles followed by the cottage cheese mixture. Top with the 3 remaining noodles. Spread all of the remaining spinach mixture evenly over the noodles and then sprinkle evenly with the remaining fontina cheese. Lightly spray a large piece of aluminum foil with cooking spray and cover the lasagna tightly with the foil. Bake until bubbling, about 20 minutes, then remove the foil. Remove the pan and adjust oven rack to uppermost position (about 6 inches from heating element) and heat broiler. Broil lasagna until cheese is spotty brown, 4 to 6 minutes. Cool 10 minutes, then cut into pieces and serve.